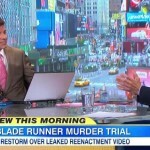 Dan joined George Stephanopoulos at the table, on Good Morning America, Monday July 7th, to discuss the latest in the Oscar Pistorius trial. A video that was meant to be private, showing Pistorius reenacting the night Reeva Steenkamp died, has leaked to the public. The video shows Pistorius without his prosthetic legs on acting out the movements the night he shot and killed Steenkamp, claiming he mistook her for an intruder. The Pistorius’ team hired a U.S based company to shoot the film for trial preparation only and it was never supposed to air, however, it was obtained illegally and leaked without permission. Says Dan, “For whatever reason that they created it, it is appalling that it was leaked. Look whatever you think of Oscar Pistorius, even if you think he’s totally guilty, the fact that some vendor out there, it seems — again, it seems — leaked this video, is appalling. I mean this is part of the defense preparation. I don’t think prosecutors would have even asked to introduce it even if they weren’t at the end of their case, knowing that this is effectively part of the work product of the defense. But it would be valuable. If you’re the prosecutor in this case, and you can use a video like this, you can go point by point and compare small discrepancies between what Pistorius said and what’s on this video.You can also show him more mobile without his prosthetic legs than he’s claimed at trial. So it would be valuable, but I don’t think prosecutors are going to ask for it.” Watch the full clip here.